The Great Barbeque 🍢 Nights! Only on Winters! Great BBQ nights are best enjoyed! It has been almost 3 years thatProtected content is a choice of Dinnernations Activities! Why? Here are all the reasons! ✔ Networking+ Lots of Chatting! 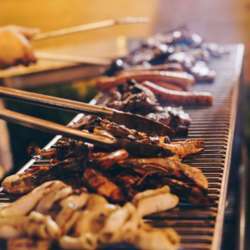 We have arranged the best rate of AED 105/ BBQ Buffet consists of chicken, steaks, seafood, veggies, salad bar and so on Protected content . Note that there is no "A La Carte" Menu available on that night, seats are reserved for the "Buffet Reservations" only. The payment for this reservation is strictly guaranteed, as we trust you we will not take payment from you in advance but only during the event, but we will have to pay a deposit. So you'd better show up :) If you'd cancel for less than 48 hours in advance you will still have to commit with the payment. Feel Free to Bring your Friends so we can share the Experience of InterNations' Events - but ask them to signup at the community first. >Activity Photo Policy: We will always take group photos for our activities. Singing up to the activity is your consent for your photo to be taken. We will be waiting for all of you!